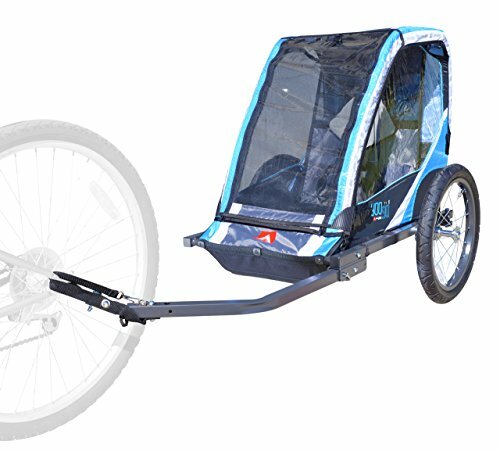 The Allen Sports T1 1-child bicycle trailer offers the perfect outdoor solution for active parents. The item quickly sets up as a bike trailer right out of the box. 16 inch rear wheels deliver low rolling resistance, and large front and side windows let your passenger enjoy the ride. The T1 trailer includes a foot bar that protects your children's feet, and also comes with a removable three season bug and rain Shield. The padded five-point safety harness securely holds your child in place during use. A universal coupler secures to your Bicycle's rear axle and makes installation and removal from your bicycle a snap. The trailer also includes a safety flag for added visibility when riding. All allen trailers PASS the ASTM trailer safety standards. Allen Sports has manufactured top quality products for the outdoor industry since 1965. Still family owned, all of our items are backed by our lifetime warranty (please visit allen web site for complete details). If you have any questions about this product by Allen Sports, contact us by completing and submitting the form below. If you are looking for a specif part number, please include it with your message.